Apple has likely just made its aesthetic-obsessed Mac fans very, very happy, with the wireless Magic Mouse 2, Magic Keyboard and Magic Trackpad 2 in its Space Gray color going up for sale on their own. Up until now, these accessories were only available with the purchase of an exorbitantly-priced iMac Pro computer. Today, the input devices were made available for individual sale, with no announcement, directly following the debut of the New iPad 2018 for students. However, knowing how badly sought-after these colors are, Apple has decided to charge extra for that demand – a peak Apple move. All three of these peripherals cost another 20 dollars or pounds for nothing more than a fancy color swap. 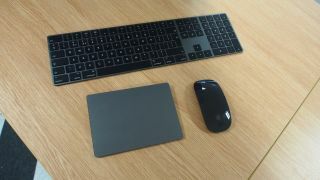 To be clear, the standard white-and-silver Magic Mouse 2, Magic Keyboard with Numeric Keypad and Magic Trackpad 2 cost $79 or £79, $129 or £129 and $129 or £129, respectively. For those same peripherals in Space Gray – with absolutely nothing else changed – Apple wants $99 or £99 for the Magic Mouse 2 and $149 or £149 for the Magic Keyboard and Magic Trackpad 2, respectively. Of course, we anticipate these to be sold out within minutes of this time of writing, and that’s on entirely on you if you want your Mac accessories to match your shiny new MacBook Pro or 12-inch MacBook. As for us, we’ll stick to this perfectly fine, white wired Mighty Mouse that works (nearly) all the same.